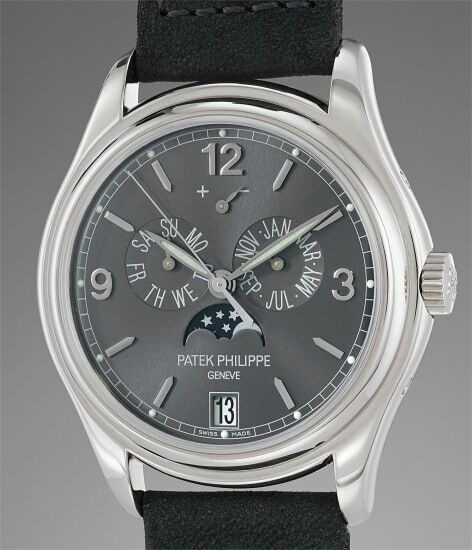 Reference 5146 is part of the annual calendar line of wristwatches by Patek Philippe. Intriguingly enough, Patek Philippe was the first watchmaker ever to offer an annual calendar watch with reference 5035, launched in 1996. Before this innovation, watchmakers were offering either highly complicated perpetual calendar pieces, or relatively simple triple calendar watches, without an intermediate step. The success of this complication prompted Patek Philippe to introduce it in a variety of timepieces: from the Nautilus 5726, to the chronograph 5980. However, reference 5146 maintains intact the aesthetic canons of the original reference 5035, distinguished by three subsidiary counters at 2, 6 and 10 o’clock. This architecture coupled with the distinguished slate grey dial and the timeless Calatrava proportions of the case creates a supremely elegant timepiece. Reference 5146 was launched in 2005 in yellow and white gold. The platinum version debuted the following year and finally 2008 saw the introduction of the pink gold version. So far, 19 white gold examples with a slate dial have appeared on the market.